A comic strip conversation incorporates the use of simple drawings to illustrate the interaction which comprises the quick exchange of information conversation entails. It is an effective tool for parents and professionals working with students with autism and other developmental disabilities because it creates a visual component to an abstract subject they find complex and often perplexing. Comic Strip Conversations identifies what people say and do, emphasizing also what people may be thinking. Written for children aged 2-6 the social story approach has become established over the last decade as a highly effective way of teaching social and life skills to children on the autism spectrum. In short narratives, the stories show children step-by-step through basic activities such as cleaning teeth, having a bath and getting used to new clothes. They also help children to understand different experiences such as going to school, shopping and visiting the doctor. Since the early 90s, Carol Gray's world-famous Social Stories have helped thousands of children with autism spectrum disorders. 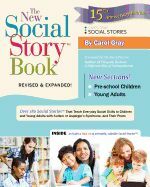 This 15th Anniversary Edition of her best-selling book offers ready-to-use stories that parents and educators have depended on for years, and new sections added are: How to most effectively use and apply the stories; How to improve the lives of younger children; and Social Stories for teens and adults with autism. Developed through years of experience, these strategically written stories explain social situations in ways children and adults with autism understand, while teaching social skills needed for them to be successful at home, school, work, and in the community. The authors explain the key elements of Social StoriesTM, review the guidelines for writing them, and help writers to structure and develop their stories. They provide detailed guidance and encouragement for the different stages of what is often a challenging process, offering advice on presentation and suggestions for using the approach to enhance other strategies. Revealing the Hidden Social Code is essential reading for any professional, parent or carer wanting to employ Social StoriesTM to address the kinds of social challenges commonly experienced by people with ASDs.